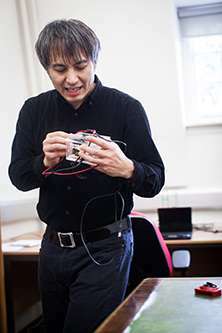 As the mobile phone industry undergoes sweeping changes, Professor Adrian Cheok, Professor of Pervasive Computing, discusses smart watches, haptics and mobile phones that send text messages and sweet fragrances. Recently, we've seen wrist watch devices produced by the likes of Sony and Samsung. The concept is hardly new. If you look at science fiction on television from the 1950s through to the 1970s, there was always the 'watch communicator'. People have a desire for something wearable on the wrist. I think this form factor has been tried several times before but for the average consumer, it hasn't really taken off and I think even now, these devices are yet to become mainstream. Compared with what you can do with a smartphone, the watch devices made by these mobile phone makers are still much more inferior in their functionality. The real application is for the user to connect to their mobile phone. If you get a message on your phone or some kind of Twitter or Facebook alert, or instance, it shows up on your wrist. So right now these watches are really connections to your phone and calendar. Certainly, there is some value, but it isn't enough to justify one wearing a watch all of the time. For several years I have been working on haptics - ways that people can produce touch through the internet. I have created hugging suits for parents and children, for instance, to embrace and hug each other at night time. What I want to do now is to try to make something that is small and very mobile with commercial applications. My haptic ring device, is another example. The basic idea is that we can now communicate through touch - physical touch rather than just text and audio visual means. Basically I can squeeze my ring and the person I am communicating with will also feel a squeeze on his finger. The other person's ring, who is another place, will see his ring light up and I will also feel a squeezed sensation in my finger. In this way we are bringing emotional and touch communication to mobile devices. Touch, taste and smell are senses that are directly connected to parts of our brain controlling emotions and memory and we can therefore produce new forms of emotional communication through technology. We have had enquiries from major multinational finance and IT companies for business applications. Busy investment bankers monitoring the stock markets, for example, who don't always have time to look at their screens, can receive different kinds of signals - pressure and various kinds of vibration patterns based on stock prices. They can wear a ring like this for 24 hours a day and be constantly updated with stock prices. Many kinds of applications including communications, business and entertainment can potentially use this technology. Smell and taste are the least used senses for communication over the internet. We have made a device enabling the user to receive a text message and produce a scent; we want people to not only send a fragrance with text but to also convey an emotion. A sweet smell, for instance, would be a positive emotion, while a rotten egg would be for a negative emotion. It is a truism that smell directly affects one's moods at a subconscious level so this kind of technology is important for bringing emotional communication to the internet. You can also imagine that this could also open up possibilities for advertising products. We have had an enquiry from a company that makes frozen food; we cannot smell frozen food but if you can have this kind of device when you pick up the frozen food, it can connect to your phone and release a smell which makes buying such food more attractive for customers. We are also working with Mugaritz, one of the most famous restaurants in Spain, to bring their Michelin starred dining to the public. The best way to do this is to convey visuals of the dishes via phone together with the flavours and aroma of the cuisine. Touch and taste is important for allowing people to have a direct experience of something. It is difficult to describe smell with photographs or text. This is why I believe the devices I am developing will bring new kinds of entertainment, advertising, and communication via the internet and mobile phone.